Twelve-year-old Phoebe Plumm lives a privileged life as the daughter of Jules Plumm, an executive of The Foundry—a company that produces all items of mechanical and technological worth available in the world. While waiting for Jules to return from business trips, Phoebe spends her time playing tricks on the people who annoy her, and that includes Micah, the ten-year-old son of one of Phoebe’s servants and a boy with an aptitude for machines and a love of adventure. When Jules comes home from an extended time away, he is panicked and preparing to remove Phoebe from their home for reasons he won’t explain. Before they can make their way to safety, the two of them are kidnapped by a pack of mustachioed robots controlled by the head of The Foundry, and Micah witnesses the abduction and vows to save Jules. Thus begins a science fiction/fantasy/steam punk adventure set in Mehk, a land of living machines. 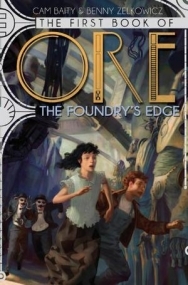 If ever a book was meant to be a movie, it’s THE FIRST BOOK OF ORE: THE FOUNDRY’S EDGE. The authors, Cam Baity and Benny Zelkowicz, have movie and TV credentials, and that shows as the story they tell seems wonderfully illustrated despite the absence of pictures in the book. The machines of Mehk have their own culture, language, and religion, and the descriptions and abilities of the different races/species help propel the sometimes plodding plot. Pheobe is a heroine whose personality grates at first, but as the book progresses she grows into her own, and she is far less obnoxious in the final chapters. Micah, too, is not the most sympathetic of characters, but he also matures a bit as the pages turn, and he’s more likeable as the first book in the Ore series comes to a close. The book is said to be a middle grades book for ages 8-12. THE FOUNDRY’S EDGE will definitely challenge eight-year-olds, and plenty of kids on the higher end of that age range will want to keep a dictionary handy as they read. The world building in the book isn’t subtle, so there’s a lot of information to collect and retain, and the violence in it may be off-putting for some too. All in all, this is a pretty good book, and now that the stage has been set, I expect the next of the series will be even better.